Get to know Assistant Director Dr. Nefeli Schneider! Assistant Director Dr. Nefeli Schneider, left, with Director Dr. Allison Friederichs. "I originally was born in Athens, Greece, and immigrated with my family to Canada and then to the U.S. when I was 10 years old, and can still speak Greek. I attended the University of Colorado in Denver for my bachelor’s degree as well as my master’s degree in psychology, and a master’s in anthropology. Eventually I obtained my doctorate in educational psychology at the University of Colorado at Boulder. While attending all my degree programs, I worked full time in the field of developmental disabilities and mental health. I started out in the field by administering and interpreting intellectual and psychosocial testing and then directed several large programs serving people with intellectual and mental health disabilities. I am passionate about advocating for the rights of people with disabilities and participated in numerous human rights and ethics committees and evaluated service providers to assure high quality programs. I also have a passion for teaching and created several value-based staff development and training programs. I have been an adjunct faculty member for several colleges, but I am especially proud of having taught at Columbia College-Denver for the past 15 years. When I have time I really enjoy creating artwork and especially watercolor and original stained glass. I am a great supporter of keeping active and maintaining good physical health and have taught aerobics classes in the past, hiked beautiful peaks in our national parks and love to scuba dive and snorkel in beautiful waters such as the Caribbean and the Pacific. I am thrilled to be part of not only a great college like Columbia, but also to be partnered up with a great director and an amazing team at the Denver campus." 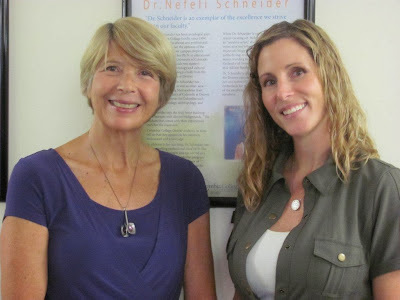 Wednesday, November 20, 2013 Chk out- Get to know Assistant Director Dr. Nefeli Schneider!